These efficient, low-cost modular bar storage racks take only minutes to set up. Bar storage racks stack up to 5 racks high. 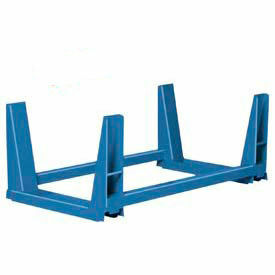 These lightweight pipe racks are made with heavy duty welded steel. Modular lumber storage racks provide highly flexible storage for all types of materials. Installations are expandable in width, height and length. Storage racks are easily shifted to meet changing storage requirements. Simply stack to the depth, height and width you require for space-saving economical storage. Please reference dimensions chart when looking at the grid. Inside Dimensions - Deduct 4". Use two racks to support 8'-10' long bars, three racks for 12'-16' and four for 16'-24' long bars. 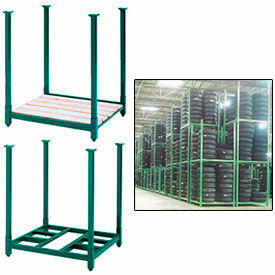 Stacking Storage Racks Provide A Convenient, Economical Alternative To Pallet Racks. These forkliftable storage racks accept pallet storage or can be used as a pallet itself. Base allows 4-way forklift access for portability even when loaded. Stacking racks have a 4000 lb. load capacity and are made with 1-1/4 x 2-1/4 x 10 gauge tubular steel. Posts allow stacking up to 4 units high. When stacked, storage racks eliminate load-on-load contact that causes product-crushing damage found on standard pallet racks. Stackable storage racks have 4-1/2 under clearance. 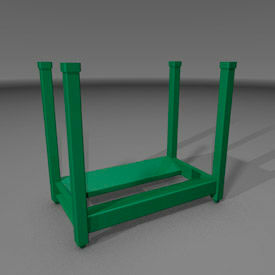 Open Deck Racks include base and 4 posts. Wood Deck Racks include base, 4 posts and 5-1/2 W x 3/4 thick pine planks to provide a closed base surface. Easy modular assembly; posts snap into sockets on base, no tools required. Green enamel finish. 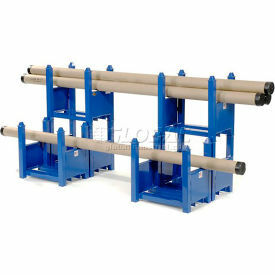 Steel King Reel Racks are designed for efficient, low cost handeling of steel coils, reels and other circular products. These racks offer maximum product protection as well as dependable, maintenance free storage. Made of heavy duty welded tubes with 6,000 lbs capacity per unit. Available in four colors. All models are fork lift movable and stackable up to 4 units high. 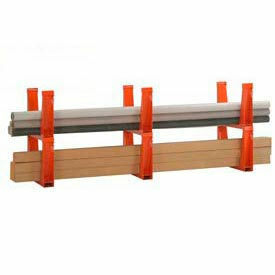 Safety U-Rack Storage Racks Securely Hold Bars, Channels, Angles, Pipes, Lumber And Other Long Items. 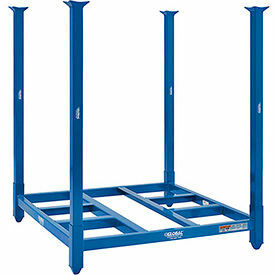 Safety U-Rack Storage Racks can be stacked up to 4 high for added versatility. Safety pins lock stacked pipe racks together to help protect employees from injury. Bar and lumber storage racks are made with heavy duty welded steel for long lasting durability. Available load capacity is 10,000 lbs. Color finish is Orange. Dimensions vary per model. Twin U-Frame Racks Can Be Used In Multiples With Fork Lifts To Provide Length And Tier Height Needed For Storage. U-rack storage racks are used for storing bars, channels, angles, pipes, lumber and more. Safety U-racks stack up to 4 high for efficient storage. Durable welded, formed steel provides strength for stacking. Made using 2 U-racks connected with steel framing to provide optimum storage. 5,000 lb. capacity. Fully assembled. Internestable Stack Racks Are Used For Varying Storage Needs. 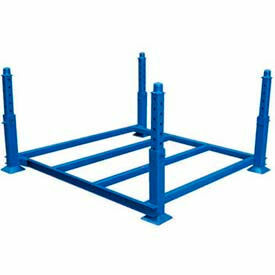 Internestable Stack Racks are made of solid steel deck construction and welded steel with painted blue finish for long lasting durability. Remove or change post height depending on application. All heights noted are for load heights. Weight capacity for all units is 4,000 pounds. Design allows for stacking up to two (2) units high. Large target and pintle provide speedy alignment. Units are available with fork lift pockets, solid decking and caster kits upon request. Available in Internestable Rack, Internestable Rack Base and Internestable Rack Posts. Dimensions vary per model. These forkliftable storage racks accept pallet storage or can be used as a pallet itself. Base allows 4-way forklift access for portability even when loaded. Stacking racks have a 4000 lb. load capacity and are made with 1-1/4 x 2-1/4 x 10 gauge tubular steel. Posts allow stacking up to 6 units high. When stacked, storage racks eliminate load-on-load contact that causes product-crushing damage found on standard pallet racks. Stackable storage racks have 4-1/2 under clearance. Open Deck Racks include base and 4 posts. Easy modular assembly; posts snap into sockets on base, no tools required. Blue enamel finish.